Am I RIGHT?!?!?! It’s the perfect blend to show you all who will be returning and just a peek of where it starts. While I could write an entire blog post dismantling the trailer, instead I decided to post a fun list of what items I would suggest you get if you’re hosting a Gilmore Girls Watch-A-Thon for the revival with your friends and/or family. Personally, I’ll probably try and host a viewing party with my mom, cousin and sister-in-law, it should be great fun! It’s not Gilmore Girls without a substantial amount of coffee. Coffee is as big a character in this series as Rory and Lorelai. And if you’re feeling a bit more Luke Danes that Gilmore, go for some of your favorite tea. 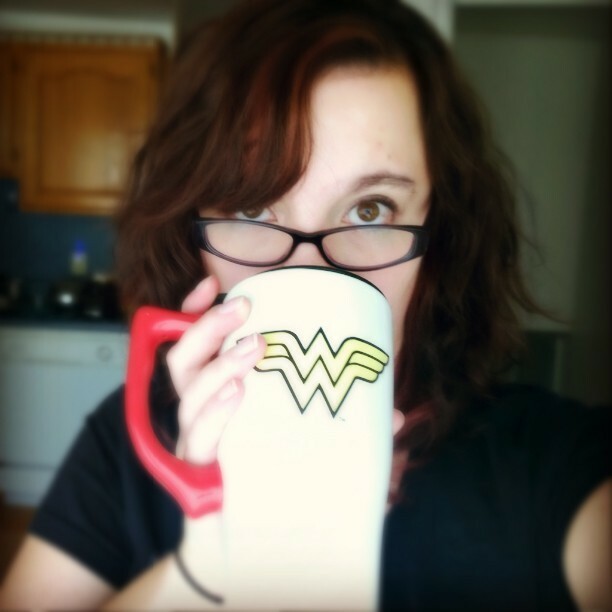 You may even want to try some of the fandom flavored tea from Adagio Teas. Whether you and your group go out to your favorite coffee shop before you start the watch-a-thon, or maybe make a run half-way through, a warm beverage is going to be a must. 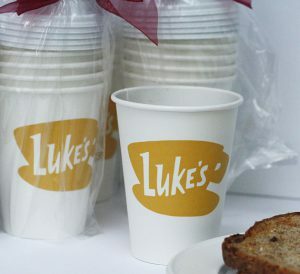 Of course, it’s even better if you can put it in these awesome Luke’s Diner Coffee Cup*. 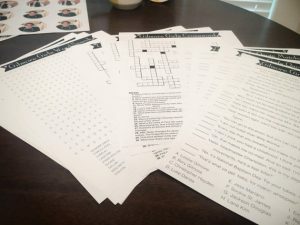 While searching through the interwebs to find some fun Gilmore Girls Party Games*, I found some cute printables of crossword puzzles, word search, quote matching and bingo! And if you’re in the mood to make your watch-a-thon a bit more adult, you can even try this Buzzfeed Drinking Game which should make the rest of the evening PRETTY entertaining. 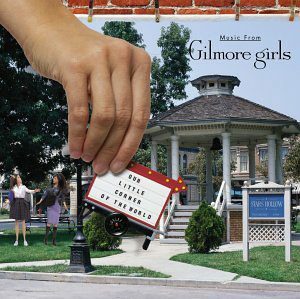 Our Little Corner of the World: Music From Gilmore Girls* should put everyone in the right mood. With Sam Phillips and her “LaLa”s it brings all those feelings from the past couple years back and puts you in the mood to handle Rory and Lorelai’s hijinks. 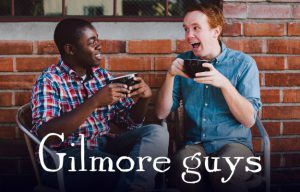 Addtionally, if you’re not in the mood for the LaLas, check out the Gilmore Guys Podcast for a big laugh and honestly, these guys speak what we’re all thinking most of the time. Lets be real, order take from your favorite or not so favorite place to eat. The Gilmore’s rarely cook, and when they do it tater tots and pop tarts (not together, but I wouldn’t put it past them). 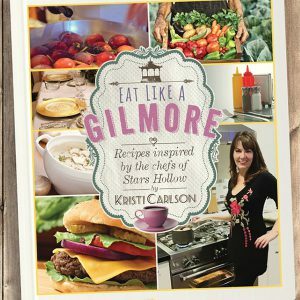 But if you feel like embracing your inner Sookie, there is an Unofficial Gilmore Girls Cookbook*. 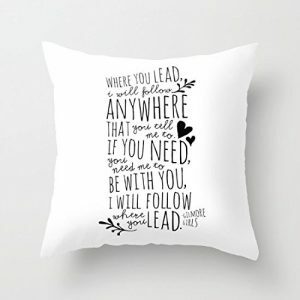 If your party is simple and just a couple of you, spring for some larger fun items like a Gilmore Inspired pillow (I honestly just love the typography of this pillow). Even if you can’t afford to get it for all of your guests, they’re fun pillows to have just for you! 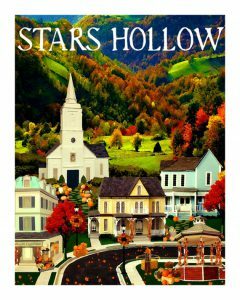 Same thing goes for this Stars Hollow Print*, which you can also get as a Spring or Autumn print. Considering that the revival episodes are each of the four seasons, this seems an appropriate piece of decor. Remember when we talked about coffee? LOOK AT HOW CUTE THIS COFFEE QUOTE EMBROIDERY* IS!!! If you’re going for the swag option and don’t want to fork out too much money, check out these cute Luke’s Diner Pins* and Gilmore Girls Drink Koozie* to gift the Gilmore Girl (or Guy) in your life! Are you as excited about the revival as I am? What are your fun plans for it?